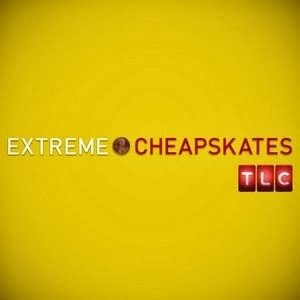 We were channel hopping the other day and came across this little beauty of a show, Extreme Cheapskates. TLC have some amazingly odd, yet magnetically charged programming. Extreme Cheapskates is centred at watching how a group of uber-frugal men and women save every last cent from their dollar. From splitting a 2-ply toilet roll so you get 2 rolls for the price of one, gold-finger material if you ask me - although if he could get my eldest boy to reduce his consumption of the stuff that'd be great, to dumpster diving for food that restaurants and shops have thrown out. It's part inspirational, as you can see people trying to get more for less and doing their bit for the environment, and part job-dropping oh my work what the actual heck are you thinking of. But in a world where people are looking to save money in any way possible could you see yourself turning, even just a little bit, in their direction? Or are you more of a couponer.